Submit YOUR great Central California photo! 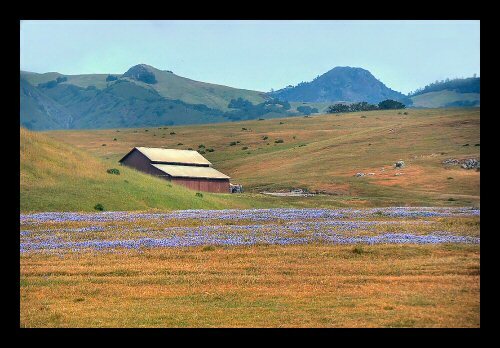 Spring is now here and that means wildflower time in Central California. The past winter was exceptionally dry, one of the driest on record, but it remains to be seen what sort of season we will have for central coast wildflowers. While botanists have determined some of the factors regulating the germination and bloom of wildflower seeds, there appears to be a great number of those factors, including the amount and timing of winter rains, average temperatures, soil moisture and so on. That is to say basically that no one really knows until it is over whether any particular year will be a good one for wildflowers. Some years are good for some species and not so good for others. All that aside, it's too early to tell about this year. So what we can do is enjoy photos of previous years, like the great picture above, and wait for reports to come in. There are some sites that post observer's reports on wildflowers and they can be helpful. The best known of these is the Theodore Payne Wildflower Hotline. They issue a weekly report every Friday starting in March and going through the month of May. This week's report (March 9) states that they haven't received any observations from Central California yet. However, that doesn't mean that there aren't any wildflowers here. The hotline tends to focus on the better known areas for wildflowers. There are some lovely places here that usually come through with good displays. One of these is Shell Creek Road in northeastern San Luis Obispo County. There is a blog with some good flower pictures of this area from 2010 here. I've created a little tour on Google Maps right here which is a lovely backroad drive even if this isn't a good year for wildflowers.